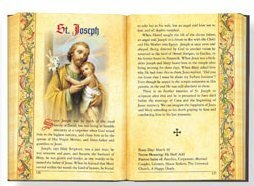 DIVINE CHRISTIAN GIFTS - Deluxe Illustrated Book of The Lives of the Saints. Deluxe Illustrated Book of The Lives of the Saints. Deluxe Illustrated book of the Lives of the Saints with leatherette cover, gold foil stamping and embossing. The book contains 244 beautifully colored pages. Leatherette Cover, Size 4 3/4" x 6 3/4". Deluxe Illustrated Book of Mary. Glass Holy Water Bottle Saint Pio. Divine Christian Gifts, PO Box. 96, Malton, YO17 1BS, United Kingdom. UK Freephone number: 0800 4334 566. Company registered in England & Wales with the number 8884705. All prices are inclusive of taxes (inc VAT) and all orders will be dispatched via our UK distribution centre. however, if you are unable to locate the item that you want to buy, please contact us.